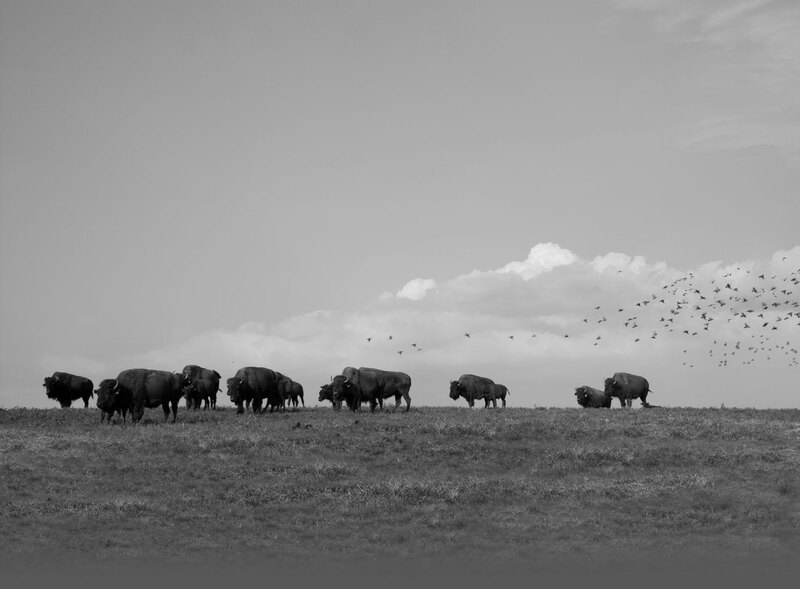 Woodland Farm has been sustainably raising American Bison 1996. Our pasture-raised American Bison is a healthier, more flavorful choice. Bison meat is rich in protein, high in iron, and lower in fat and cholesterol than skinless chicken and turkey. Our meat is distributed by a division of Woodland Farm, KY Bison Co.
We are committed to sustainability; we never use hormones or low-level antibiotics in raising our animals. Our bison graze on open pasture at our Goshen, KY farm and are professionally managed. To ensure the highest quality at all stages of production, we process at our own Animal Welfare Approved,™ USDA facility, Memphis Meat Processing. Our retail store has moved to the farm! Every Tuesday – Friday from 8am – 4pm customers can purchase cuts of bison (and pork and eggs) directly from Woodland Farm at retail prices. With enough advance notice, we can offer absolutely any cut. Wholesale pricing is available for restaurants and retailers. Other items like hides, skulls, and horns, are sometimes available for special order. Please call us at 502.222.7051 or email us for more information. KY Bison from Woodland Farm is available at specialty markets and quality restaurants throughout Kentucky. A few of the local markets who stock KY Bison include Kingsley’s Meat Market, Paul’s Fruit Market, and Rainbow Blossom. You can also find KY Bison from Woodland Farm on the menus of restaurants around the area, including Proof on Main, The Oak Room, Bluegrass Brewing Company, and many more. KY Bison Co. does sell high quality breeding stock. Our herd, which includes approximately 300 Plains and Woods Cross Buffalo, has grown from base stock purchased from national shows and well-known buffalo farms. Contact us to discuss purchasing a prime bison to help build and strengthen your herd.